Supplied to operate with the humidifiers – specifically designed to provide the duty required in a safe and efficient manner. The sequence to produce fully treated water is to pass the mains water through a water softener to remove the hard calcium and to replace it with sodium – this helps to prevent hard scale from blocking the reverse osmosis membranes. Carbon filters would then remove the chlorine from the water – chlorine ‘eats’ the membrane which reduces the membrane lift significantly. Reverse osmosis then removes the minerals from the water which prevents a steam humidifier from scaling up and an adiabatic humidifier from generating mineral duct or from blocking up nozzles. An Ultravoilet sterilizer in the case of the adiabatic system would ensure that the water serving the humidifier is bacteria free. Water management in accordance with L8 and approved codes of practice is still required to ensure water hygiene. 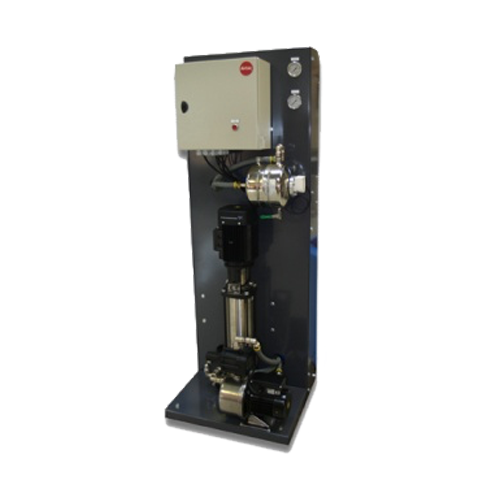 These systems are specifically designed to operate with the flow patterns and water volumes of the humidifier that you are looking to serve.